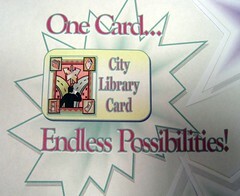 Manchester City Library is proud to announce the launch of our 4th annual One Card….Endless Possibilities Fall Library Card campaign. We have 32 local Manchester businesses all set to offer a plethora of discounts and freebies guaranteed to make you glad you have this “One” card. Be sure to stop in to the library to pick up a brochure which lists the businesses participating and their discounts. BUT wait that’s not all! You can earn one raffle ticket a day when you check out materials to be entered in raffle prize of your choice. We have 2- $25 gift certificates to the popular Puritan Backroom Restaurant. Vertical Dreams is offering 2- free day passes with equipment rental for you to try your hand at conquering New Hampshire’s tallest indoor climbing wall and The Music Connection, a great spot for vinyl junkies, has sponsored 4- $25 gift certificates for merchandise at their establishment. The piece de resistance, however, is our Grand Prize! Citizens Bank has donated 2 Barnes and Noble Nooks with cases. To be eligible to enter the Grand Prize drawing pick up a raffle card at circulation desks at Manchester libraries. Staff will fill you in on all the particulars regarding the how-tos of entering the Grand Prize drawing. Sages say your library card is the most desired of all freely obtained cards! Invest wisely in the month of October by making sure you have a Manchester City Library Card. While you are at it, check out our One Card video promoting our program and participating businesses (Click here for video). Our special thanks goes to The Acting Loft and Float Left Labs for their contributions to making this video a success! One Card hits the halfway mark!